Luckily, this chilled broccoli soup recipe from Sassy Radish appeared at just the right moment in my life, and I was able to press it into action right away. Nash’s graced us with both broccoli and green garlic in our CSA box this week, Seattle provided us with soup weather today, and the rest, as they say, is history. We ate the soup warm the first time, as eating a cold broccoli soup would have required either advance planning or patience, neither of which I could muster today. But now that it has thoroughly chilled in the fridge, I can confirm that it also makes an excellent chilled soup as intended. Either way, a crusty chunk of bread and a soft cheese alongside will make this a a nice summer meal. 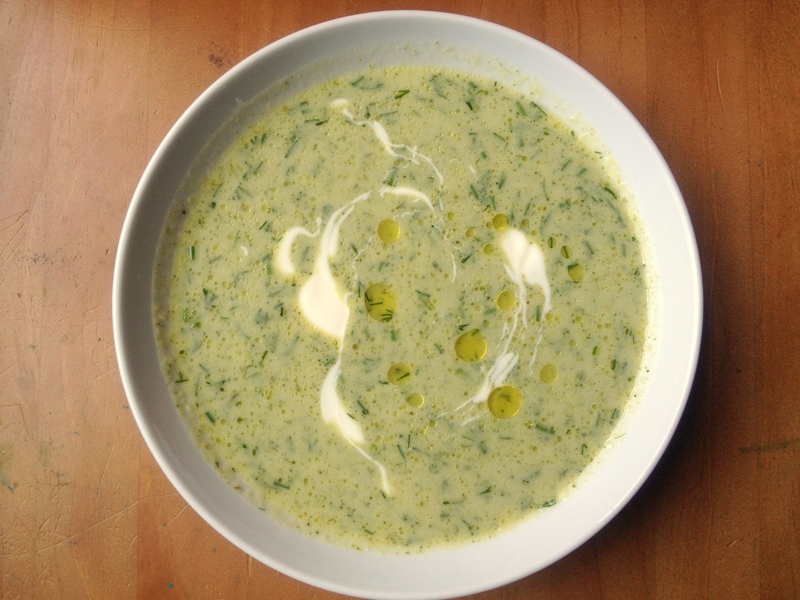 Broccoli and Green Garlic Soup: Trim the woody stem-ends from a bunch of green garlic and chop it into 1/2″ lengths. Chop a pound of broccoli into florets, then peel a thick layer from the stems and chop those too. Cook all the broccoli and green garlic in olive oil over medium-high heat until browned in a few spots. Add 4 c. water and 1 tsp. salt and bring to a boil, then lower the heat and simmer about 15 minutes, until the broccoli is tender. Puree the soup until smooth. Add 1 c. plain whole-milk* yogurt, a handful of chopped dill, a good glug of olive oil and the juice of half a lemon and stir well. The original recipe has you puree the soup again with these additional ingredients, but I just stirred them in and liked the crunch of the dill. Taste it and see what you think; give it another whirl in the blender or adjust the seasonings as you see fit. Serve hot or cold, garnished with a swirl of yogurt or squeeze of lemon and a few drops of olive oil. *Be careful using low-fat dairy products in hot soups; the heat can make them curdle. If you want to use lower-fat yogurt, allow the soup to cool for a bit before adding it. This entry was posted in Food, Recipes, Soups and tagged broccoli, chilled soup, csa, green garlic, Nash's, summer recipes, vegetarian recipe on July 15, 2012 by emmycooks. Have you ever tried the most simple broccoli soup? Just boil broccoli in salted water and puree. Nothing else. Remarkably good! Remarkably simple as well. I’ve made a ton of complicated broccoli soup recipes over the years, but never thought to do that! I used to do the same thing with my browser until I discovered Evernote to organize my online recipes. It’s free and AWESOME! And the soup looks yummy. Added to Evernote! Me too! I get sucked in and I’m not even sure why I’m spending the time “pinning” things. Evernote is SUPER practical, and syncs with all your devices, so when you’re at the store, you can look up that recipe you saved. Can’t do that with a bookmark! Wow, K. NEED IT. Watching tutorial now (literally). And you can’t beat free! Happy to have turned you on to it! 1 – I love your high-tech strategy, that made me laugh out loud. 2 — shoot, I just remembered I have broccoli in my fridge that is probably a bit tired by now and would do well to be blended up. I know what I’m making for dinner! Leaving a bunch of tabs open for days on end does sound awfully familiar… :) This broccoli soup sounds amazing–perfect for summer! This looks delicious! I can’t believe that you still have green garlic. So lucky! I love the dill that you added to the soup too. I would never have thought to pair it with broccoli, but it sounds really good. Thank you so much, Emmy! You are so awesome! I was having kind of a rough day and it made me feel so happy to have something so yummy from a friend! Come and link up to this week’s party…http://inherchucks.com/2012/07/11/whats-in-the-box-34/. Looking forward to seeing you there! This looks so delicious. I’m putting it on my menu for the week. And very professional food photography here! Glad I’m not the only one with this “high-tech” approach! We love broccoli soup and I’ll be trying this one soon (if someone doesn’t close the open tab on me, that is…).